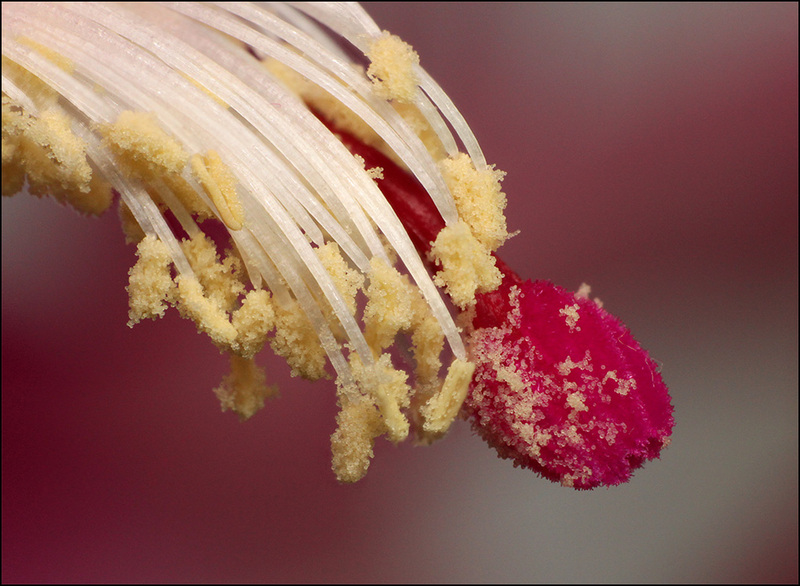 This is shot using an 18-55 mm kit lens on a Canon T1i, reversed on a short extension with aperture set at f/8 using the trick of unmounting the lens with DOF preview pressed. It's actually a short stack, 5 frames, handheld, using the camera's built-in flash diffused through a piece of Kleenex tissue held in the same hand that was cradling the lens. It's a very inexpensive and low-tech approach. Very nice Rik- I have one of these in this colour- in fact it was a shot of a bud that you chose as photo of the month a while ago! Lovely! There is a lot of texture, and occasionally colour, in many cactus stigmas. Thanks for the kudos! The "how to" is now illustrated over in Technical Discussions, HERE, near the bottom of the first post. This is a very good result considering the low-tech approach and handheld technique. Even the fine fibre on the stigma is visible. Thank for sharing Rik..
You can with a flashgun when the camera is on manual and using a small aperture. The exposure is made by the flash alone. With a very short burst between 1/1000 and 1/20,000 of a second all motion is rendered invisible! Most of my flash-based macros are now handheld.